Praise Shabbat, the deepest rest. I put in only one door, open it once a year, and never go in. Outside the walls, everything else. All I did was build a temple. I put fringes on the corners and cover myself with the cloth. Inside the cloth, I am “kadosh” and I can pray. Outside the cloth, I am “khol” and I gossip. But all I did was cover myself with a piece of fabric. I have a rimless cap. I put it on my head and call it a kippah. Inside my kippah, I’m alone but in conversation with God and my kehillah. All I did was put on a cap. I light the candle and dip it in the wine, I smell the spices and call it havdallah. After sundown, onto a year of new mistakes and hope. All I did was wait for it to get dark. I make a flimsy hut with branches overhead and fruit within. I call it a sukkah and sit down for a meal. From inside the hut, I see three stars appear. Outside the hut, I see the same three stars. All I did was build a hut. Growth, harvest, creation, sexuality, body, love. Sweetness, Fragrance, art, luxury, flavor, comedy. It is good to live well if you can. Clear thinking at last and the work begins. And separates the whole into increments that we may comprehend it. And connects us all that we may be one. “HAVDALLAH: Prayers for the Holy Separations, by Trisha Arlin” is shared by Trisha Arlin with a Creative Commons Attribution-ShareAlike 4.0 International copyleft license. Trisha Arlin is a liturgist, performer and student of prayer in Brooklyn, NY, and a part-time rabbinic student at the Academy for Jewish Religion. Trisha has served as Scholar/Artist In Residence at various synagogues in the US and was Liturgist-In-Residence during the National Havurah Committee 2014 Summer Institute. She has taught her workshop, Writing Personal Prayer, at Limmud NY, the NHC Institute, Shavuot Across Brooklyn and synagogues in New York, New Jersey and Ohio. “PLACE YOURSELF”, a collection of new liturgy and kavannot, is forthcoming from Dimus Parrhesia Press. 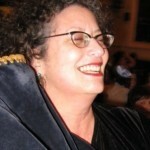 Trisha's work is published online at triganza.blogspot.com, RitualWell, and the Open Siddur Project. and in print in “Jews And Pluralism” (Ben Yehuda Press), “The Sacred Table” (CCAR Press) and "A Poet's Siddur" ( Ain't Got No Press). Please reciprocate for any adaptation or redistribution of this work by (1) properly attributing the work to Trisha Arlin, (2) clearly indicating the date you accessed the resource and whether any changes have been made (and if so, please be in touch with us and leave a comment below so that we might note your adaptation or improvement), (3) providing a link back to this source, and (4) specifying the Creative Commons Attribution-ShareAlike (CC BY-SA) 4.0 International copyleft license under which this work was shared.